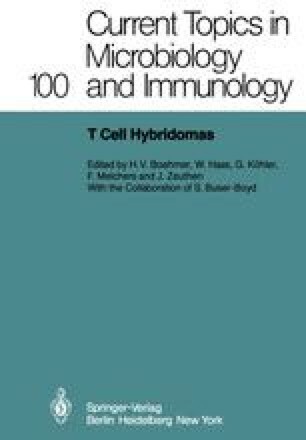 Alloreactive T cells with specificities for Ia antigens encoded by the I-A locus of the major histocompatibility complex of the mouse are known as potent inducers of macrophages and B cells which express the corresponding Ia antigens. This induction in the presence of a “bystander” antigen, such as sheep erythrocytes (SRC), leads to the induction of “bystander” SRC-specific B cell responses (1,2). Self-antigens have also been found to act as such “bystanders”, inducing autoantibody production in the corresponding B cells of the reacting host (3). Such interactions of allo-Ia-reactive T cells also lead to the production of soluble mediators which can replace these T cells in their interactions with macrophages and B cells. These mediators were originally called allogeneic effect factors (AEF) (4,5). It was shown that AEF is composed of at least two separable groups of factors: those which specifically recognize Ia antigens on macrophages and B cells (5) and others which act on activated B cells as factors stimulating successive rounds of division and effecting increased maturation to Ig secretion.